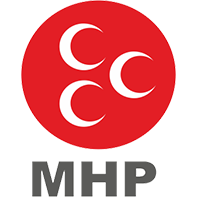 The Nationalist Movement Party (MHP) is a far-right political party established in 1969. It follows a classical Turkish nationalist line that blends Pan-Turkism and Islamism. Founded by Alparslan Türkeş, the party was part of two short-lived "National Front" government of 1970's, and was closed following the coup of 1980. Revived by former cadres in 1983, it regained its former name in 1992. Following the death of Türkeş in 1997, Devlet Bahçeli became its chairman. MHP's votes peaked in 1999 with 18 percent, making the party the runner-up. It became a partner in a tripartite and uneasy coalition until 2002, when early elections swept all the parties under the national threshold. MHP returned to parliament in 2007. Its logo consists of three white crescents on a red background.